As a physiotherapist, it is a common occurrence for someone to walk into my office claiming they have sciatica. Somehow “sciatica”, the medical term for leg pain generated by the sciatic nerve, has become the umbrella term for all pain that is generated in the back or the hips and travels down the leg. However, this is not always the case. Various body structures or tissues can cause pain to refer down the leg, and they all require different treatment. That’s why it is critical to identify the appropriate term for your leg pain before assuming it is sciatica. For example, if you are experiencing leg pain and turn to Google for sciatica exercises, you may end up with movements for the wrong diagnosis, which could worsen the problem. This blog post will discuss 5 things you need to know regarding sciatica physiotherapy, including the distinctly different causes of sciatica-like pain patterns, and how the exercises differ with each one. Sciatica is the medical term for pain traveling down the line of the sciatic nerve giant nerve that originates in your buttocks and runs down the back of the leg. With true sciatica, pain is extremely intense, and can include: numbness, tingling, pins and needles, weakness, loss of sensation, or any combination of these symptoms. Treatment for sciatica depends on what is causing the nerve irritation. Typically, nerves get compressed and irritated secondary to such pathologies as: joint injury or degeneration, inflammation, muscle tension, or disc herniations. Treatment for these pathologies differ, and will be further altered with associated nerve irritation. If you have nerve irritation of any kind, it is best to consult a knowledgeable CAMPT-Certified physiotherapist to get the best combination of manual therapy and exercise to resolve the issue. Lay on your back and bring the knee of your affected side to 90 degrees. Hold your foot flexed while you bend and straighten your knee as much as possible without eliciting pain or other symptoms. Do 15 reps slowly and smoothly with no holds. Repeat 2-5 times per day. Note: This exercise is meant to be done pain free. If it causes the pain or numbness in your leg to be or exaggerated, stop the exercise and discuss it with your physiotherapist. Facet joints are small joints where two vertebrae meet. 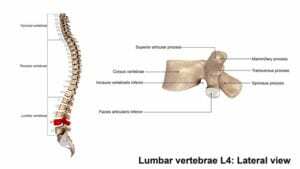 In your lower back, these are called lumbar facet joints. These joints can become injured in a number of ways, often from forced compression or too much load, which jams the joint surfaces together. When lumbar facet joints get irritated they can refer pain into the glutes, hips, and occasionally down the legs. These injuries usually have a directional preference for exercises and relieving positions. In this case, it is flexion-based or “joint-opening” exercises. You can find relief by using flexion-based positions or movements to take the pressure off the irritated joint surfaces. Lay on your back and bring both knees to your chest. Hold 30 to 60 seconds. Repeat 2 -5 times per day. Note: This exercise should always relieve symptoms, never exacerbate them. If you find this exercise is making your pain or symptoms worse you may have a wrong or incomplete diagnosis. Stop the exercise and consult your CAMPT-Certified physiotherapist. 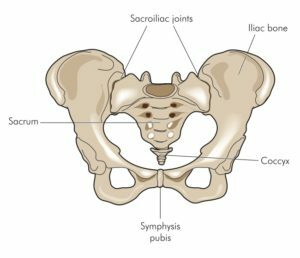 The SIJ are a pair of joints that are part of your pelvic ring. 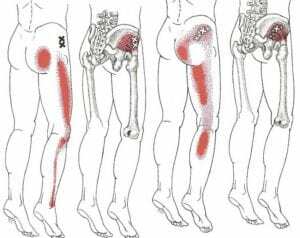 The pain patterns associated with this joint are most commonly the low back and pelvis, but can refer all the way down your leg and into your foot. Treatment for this joint commonly involves mobilizing the joint to get it moving, and core exercises to stabilize it. Place the foot of your affected side on a chair. Rock your hips forward and back into a lunge while keeping your body upright. Repeat this 15-20 times as a slow, rhythmical movement. Note: This exercise should be done every hour or two to keep the joint moving. Do not perform this exercise through pain. It should be relieving or neutral, but not irritate your symptoms. If the SIJ is inflamed it can be very tricky to find the right combination of treatments to settle it down. Once again it is best to consult a CAMPT-Certified physiotherapist. All skeletal muscles in the body can experience pain caused by trigger points. Trigger points are hyper-irritable muscle fibers that have a problem with their neuromuscular system (the neuromuscular system is basically the connections between your brain, nerves, and muscles to create movement). Trigger points commonly have referral patterns associated with them. As you might have already guessed, the muscles of the low back and hips commonly refer pain into your bum, down the back or side of your leg, and potentially all the way to the foot. It often surprises people to learn that their leg pain is caused by muscle irritation because they don’t realize a muscle injury can be so debilitating. If you have muscle trigger point pain, you will benefit from rolling. Sit on the floor with your knees bend and your affected side on a small sports ball (tennisball or lacross ball will do). Find a sore spot and stay stationary on it for 15-20 seconds. Move only slightly and repeat. Do this for 1-5 minutes every day or every second day. Note: Make sure not to over-roll a trigger point. There is a difference between rolling a trigger point and rolling an inflamed muscle. The former feels more like an intense “good” pain that provides relief when finished. The latter feels more like you are pressing on a bruise, which can cause further irritation. If you feel you have over-rolled a muscle, take a few days off rolling and consult your physiotherapist to review rolling technique and revisit your diagnosis. Intervertebral discs are the donut looking structures that are squished between vertebrae to make up your spinal column. 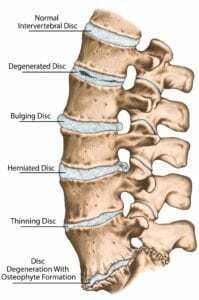 Injuries to these structures involve tearing, bulging or ruptures to the outer fibers of the disc. These injuries can result in pain down one or both legs. Disc injuries also tend to have a directional preference, but in this case the direction is extension. You can use this preference to treat the disc and alleviate symptoms. Lay on your stomach, keeping your back relaxed and do a mini push-up with just your arms. Hold for 1-2 seconds, and repeat 10 times every few hours. Note: Do not push through pain. This exercise should always be relieving. If you are experiencing pain while doing this exercise, stop and consult your CAMPT-Certified physiotherapist before continuing. It takes quite a bit of knowledge and clinical experience to differentiate between causes of leg pain, and prescribe the correct treatment. The exercises given for one person with leg pain referral might be the exact opposite for another, despite there being a similar pain pattern. Choosing the wrong treatment for leg pain can not only worsen your pain, but prolong the agony. So don’t rely on Google to tell you how to resolve your sciatica pain. Consult your local CAMPT-Certified physiotherapist to help you decide which course of treatment is right for you. Amy Fahlman is a FCAMPT physiotherapist in Ottawa, Ontario. She enjoys travel, adventure, CrossFit, running, and all things outdoors. For more insights and tips like this or to book an appointment, visit Amy’s website.